Chiaravalle Montessori, 425 Dempster St. The school received LEED platinum certification for its new North Wing addition, the highest of four environmental rating levels. 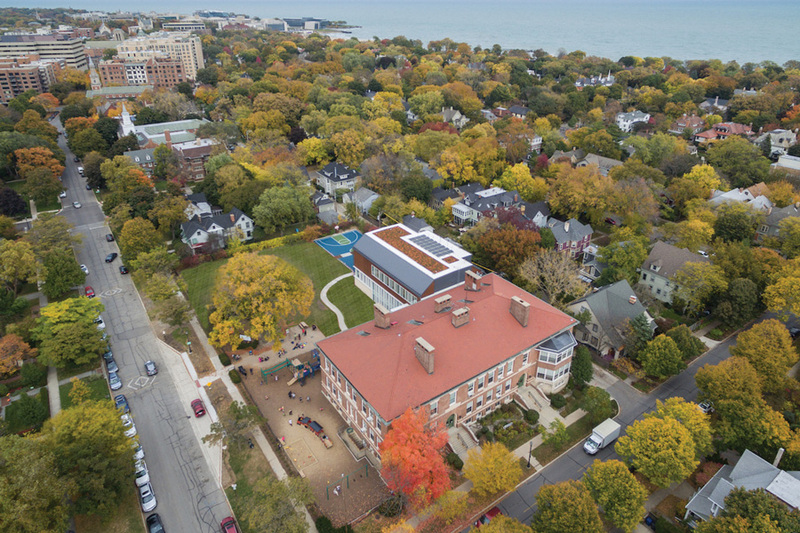 Evanston private school Chiaravalle Montessori received the U.S. Green Building Council’s LEED platinum certification — the organization’s highest level of environmental building — for its North Wing addition, according to a Thursday news release. The wing, which cost $7 million to build and opened last fall, became the first Illinois private school addition to receive the prestigious designation. The new structure combines a slew of environmentally friendly features like photovoltaic panels, a green roof, recycled materials and a geothermal system. Platinum is the highest of four LEED ratings — certified, silver, gold and platinum. To receive the designation, a building must receive a minimum number of points based on green-based construction and maintenance. Imus said Chiaravalle earned the distinction from both its energy reduction and low material use efforts. Chiaravalle communications director Beth Caldwell said the new wing — built in partnership with CannonDesign and Bulley & Andrews Construction — was a “very long vision” to complete. Founded in 1965, Chiaravalle is a non-denominational, independent, co-educational school for children ages 16 months to 14 years. The school has educated students in its current location — 425 Dempster St. — since 1980, Caldwell said, but did not assume ownership of the building until roughly seven years ago. In designing the new building, Caldwell said architects looked to both honor the school’s traditional style and construct something more contemporary. The result was a nearly 19,000 square foot addition built with roughly 42 percent recycled materials and a vegetated roof that covers about 30 percent of the roof area. “The environmental stewardship we model when we make choices to try and reach for the highest level of sustainability is philosophically aligned with (our) school,” Caldwell said. In February, Chiaravalle was chosen as one of three Illinois schools to represent the state in the U.S. Department of Education Green Ribbon Schools program, which recognizes schools that prioritize environmental education and initiatives. In a news release after the building’s Wednesday plaque ceremony, head of school Robyn McCloud-Springer said the new wing would provide additional space for the roughly 300 students who attend Chiaravalle. “We strive to be a model green school that prioritizes wellness and cultivates an environmentally informed community who will cherish and protect our planet’s natural resources,” she said.